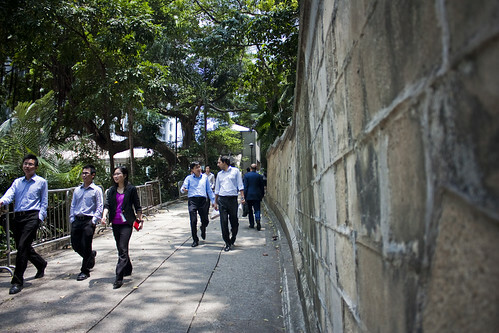 Later this year, when Hong Kong’s government moves its headquarters to a glassy new building next to Victoria Harbour, it will leave behind the leafy hill it has called home since the 1840s. Rather than conserve the hill for public use, however, the government wants to sell half of it to developers, who plan to tear it up for a new shopping mall and 32-storey office tower. “This hill belongs to the public and it should stay public,” says heritage activist Katty Law, who is part of a spirited coalition of groups that oppose the plan. Over the past few months, a litany of groups have come out against the government’s plan, including the pan-democratic political parties, designers, environmental activists, architects, historians and congregants from St. John’s Cathedral, which is located on the hill. Even feng shui masters think it’s a bad idea. 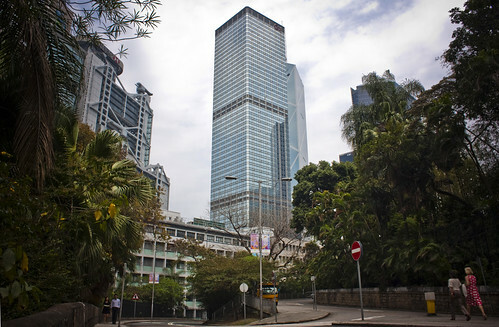 One master, who is also a registered architect, told the South China Morning Post that the new office tower would block the site’s chi, which comes from the balance between Government House, at the top of the hill, and the three 1950s-era office blocks immediately below. The government’s rationale for the redevelopment plan is straightforward: there’s a shortage of Grade A office space in Central and the new office tower would provide 28,500 square meters of it. The project is essential “to maintain Hong Kong’s competitiveness,” a spokeswoman for the Development Bureau told me. In March, on a sunny spring morning, I met up with Katty Law in front of the government headquarter’s West Wing, which would be demolished for the new tower under the redevelopment plan. We headed up Battery Path, which leads up the hill from Queen’s Road. In the middle of the 19th century, this path ran along a bluff on the harbour’s edge. When the British landed in 1841, they took advantage of the site’s strategic location to build their first offices and a gun battery, which were later joined by all the institutions of colonial power: the governor’s home, the legislative council and St. John’s Cathedral. 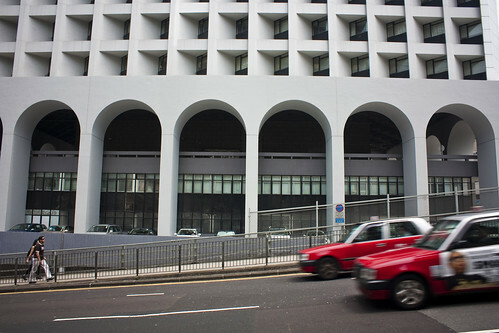 In the 1950s, the battery was demolished for the new government offices, which consisted of three Modernist office blocks arranged around a central courtyard. The government insists that its redevelopment plan will leave the hill greener than it is today, despite the fact that roads surrounding the hill will be widened. “It is our policy to ensure that no trees are unnecessarily felled or pruned,” said the Development Bureau spokeswoman. Before anything is dug up, a “detailed tree survey report” will be completed, which will be used to document all of the existing greenery. If a tree needs to be chopped down, it will be replaced, and the company that redevelops the site will be required to preserve all existing trees after the project is complete. Turning around, we walk past the Former French Mission Building, which currently houses the Court of Final Appeal; the building will be preserved after the government moves, but it is not clear what it will be used for. 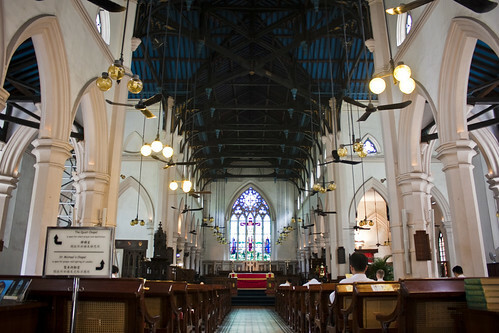 Across the way was the well-kept grounds of St. John’s Cathedral, which is a declared monument and will also be preserved. We turned into a particularly tranquil corner of the hill and stood next to a gurgling fountain. “This is actually private land,” said Law. 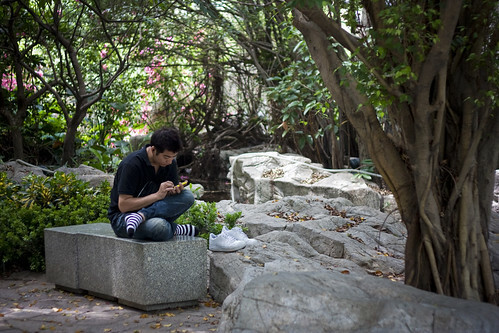 We were standing in Cheung Kong Park, a section of Government Hill maintained by Hong Kong’s largest real estate developer, whose headquarters — the third-tallest building in the city when it was completed in 1999 — looms over the rest of the hill. The story of Cheung Kong’s headquarters is controversial, and Law thinks it might foreshadow what will happen to hill if the government’s redevelopment plan is successful. 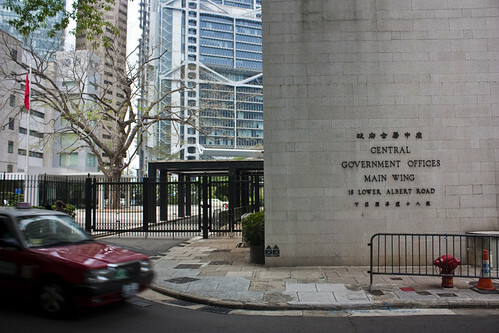 The government denies that it has made a deal with Cheung Kong or any other developer. “Like all others in the community, they had the opportunity to express their views during the public consultation period,” the Development Bureau spokeswoman said. 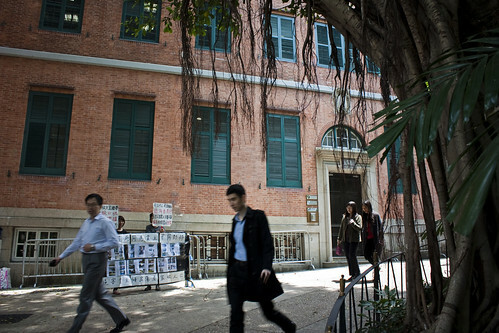 Law points out that the 1960s-era Murray Building, located across the street from St. John’s Cathedral and currently home to government offices, could be renovated to address Hong Kong’s Grade A office shortage. Instead, it will be converted into a hotel. “If they are so desperate for office space, why are they converting it into a hotel?” she asked. I passed the question along to the Development Bureau. The spokeswoman told me that converting the Murray Building into Grade A office space would damage its heritage value. She also said that the demolition of the West Wing for a new office tower would free up an extra 6,800 square meters of public open space. “Repairing and conserving the West Wing would be a much more expensive business again and it is difficult to see that an appropriate use could be found for it,” she said. Opponents to redevelopment have submitted an alternative vision to the Town Planning Board, one that would preserve the West Wing and keep the whole of Government Hill open for public use. One conservation architect has even suggested that the Chief Executive relinquish control of Government House and integrate it into a new park that would stretch from Battery Path up to the Botanical Gardens. Stopping redevelopment might sound unlikely, but Law and her allies have a good track record. In recent years, they have managed to stop the redevelopment of the former Central Police Station, Former Married Police Quarters and Central Market, all of which will now be restored and opened to the public. Her hope is now that the government’s redevelopment plans will be stalled by the Town Planning Board, which must approve any changes to the site. 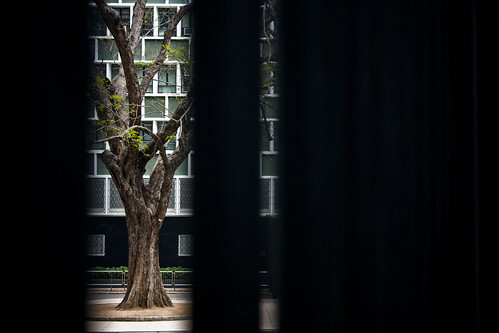 This entry was written by Christopher DeWolf , posted on Sunday May 22 2011at 10:05 am , filed under Architecture, Asia Pacific, Environment, Heritage and Preservation, History, Politics, Public Space, Society and Culture and tagged Conservation, Hong Kong, Parks, Politics, Preservation, Redevelopment, Trees . Bookmark the permalink . Post a comment below or leave a trackback: Trackback URL. Is the site accessible at all right now anyway? 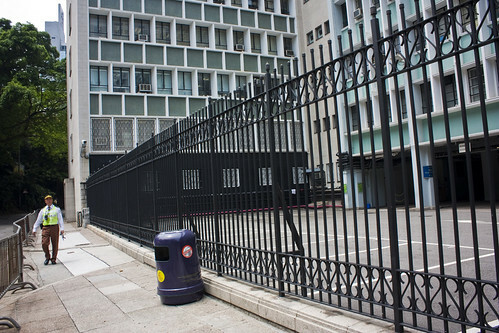 Every time I go by, I only see fenced-up government building. The doors on Queen’s road actually have keypass access. The new development plan would actually make accessible an area that doesn’t seem to be, currently. And one has to admit that the building they will tear down is quite ugly. As I wrote to Chris earlier, the spatial dynamics of this site are fascinating. 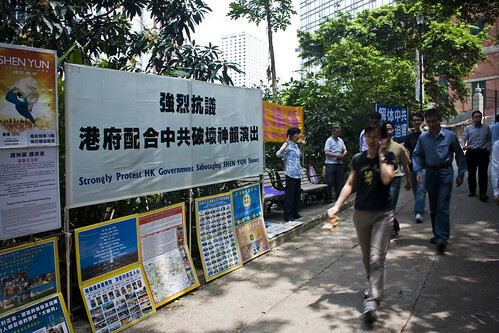 Clearly setting Hong Kong’s government institutions up on the hill was meant to establish their authority over the former colony; in later years, the siting of the Bank of China tower, which looms over the site, has served as an instructive demonstration of Hong Kong’s current hierarchy — so effectively so that it’s almost surprising that much of the land is now being sold off. One of the more interesting moves will be that of the Court of Final Appeal. Given that judges from around the Commonwealth sit in the chamber, it’s probably the most “colonial” governmental institution left in Hong Kong. 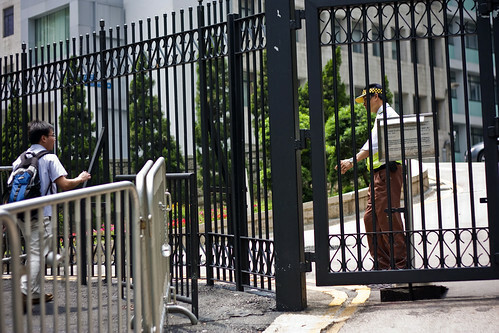 It’s being removed from its perch atop the hill and reinstated in its original home, the current Legco building, while the Legco itself is filed away in the new, faceless government center. The message, if any, seems to be that eradicating colonial symbolism or even power is not at all what matters. The order and efficiency stemming from Hong Kong’s laws, not its democracy, lie at the heart of the territory’s distinct system — probably because its legal system has served its economy very well. It’s actually quite consistent, then, with the selloff of the public space up on the hill; the courts will kneel at the feet of all this new development — serving and facilitating rather than overseeing it. – The loss of greenery, which aside from being relaxing and attractive plays a role in cleaning the air and cooling ambient temperatures. The danger is that redevelopment will gut the hillside like what happened with the Marine Police HQ in Tsim Sha Tsui. You can’t cut down a 100-year-old tree in deep soil, replace it with a two-year-old tree in a concrete planter and expect it to have the same effect. – The increase in pollution and congestion. The plan calls for roads surrounding the redevelopment site, such as Ice House Street, to be widened, which would only worsen congestion because there’s nowhere for that additional traffic to go. All the roads leading to and from the newly-widened arteries — Wyndham Street, Queen’s Road, etc. — will be just as clogged as usual. Meanwhile, more roads means more concrete, which means more heat and still-higher temperatures in Central, which is already sweltering. – The lack of accountability. The government has such a poor track record of regulating land leases, handing over a big chunk of Government Hill to a private developer is just asking for trouble. Sure, there will be public-space provisions, design requirements and so on, but will they be respected? You’re right that the West Wing doesn’t have much value and there’s not really much of a problem with knocking it down to build something more space-efficient — especially if you can find a way to recycle its construction materials into the new building. But the government is pushing this project forward on the flimsiest of excuses without much of a commitment to protect the hill’s most important qualities. That doesn’t bode well. Well, I guess time will tell. But if the plan was built as presented, I don’t see any reason to oppose it. I don’t know, my concern is that when so-called interest groups start whining, the risk is to end up like in Montreal (a city we both know well) where many projects get stopped for dubious reasons. To weigh in (quietly I hope)….HK’s government doesn’t seem to A)protect historical anything B) do nice things aesthetically C) Account for the needs of pedestrians (or even non drivers sometimes) unless A) population pressure forces them to or B) they’re dragged into it kicking and screaming.